This one is for my daughter and I am getting ready to hand it off to my quilter/friend for finishing. The back is going to be a royal blue minky with a raised dot texture. The quilt is large enough to fit on her queen size bed. I wonder how a multi-colored diamond quilt would look? Hmmmm…. I love, love, love it! It looks like it was a lot of work. I’m sure your daughter is going to love it, especially with a Minky backing. Hope you are doing well and working on some fun projects. What are strata sheets? Thanks. 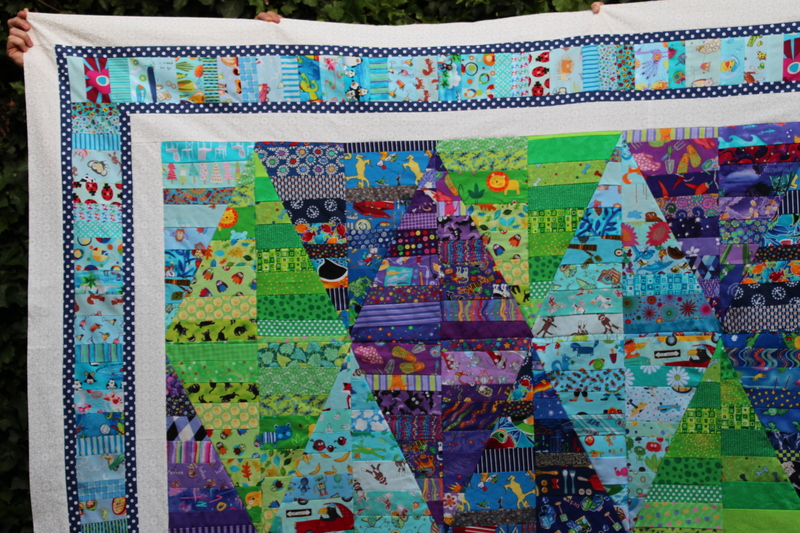 Wow – there’s a lot of work in that quilt. The design is very effective and you’re used great fabrics. I’m sure she’ll love it. This is an incredible finish, Linda! I love the cool colours. What an incredible amount of precise piecing. Love the scrappy looking strip in the border with the polka dot accents. Great job! 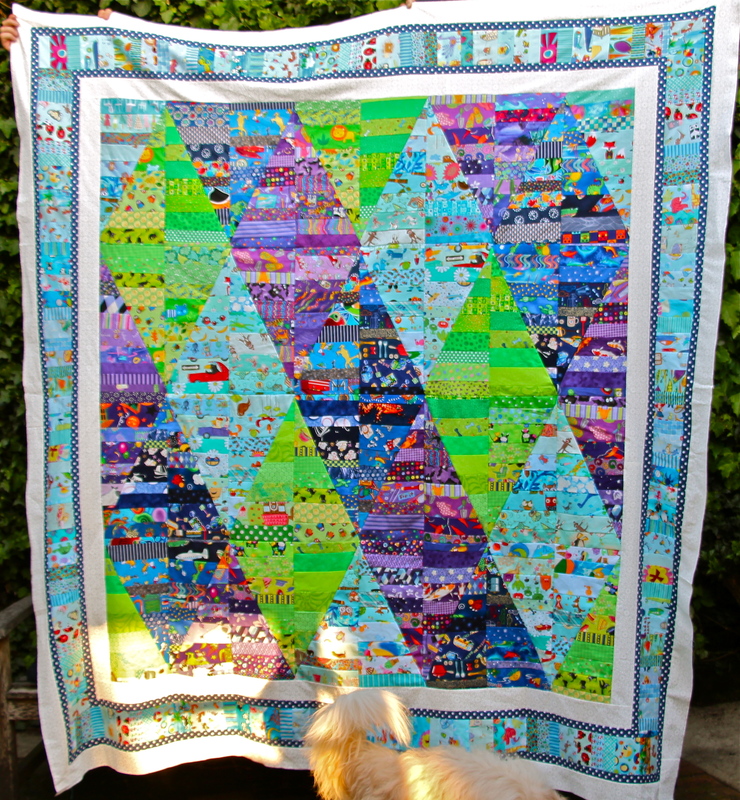 Hi Lorna – thank you 🙂 I think the best tip for making this type of quilt is using a heavy spray starch on the strata before you start making the cuts. That way the pieces don’t stretch and it makes it much easier to sew. Have a wonderful weekend! Great colours in this one and so much working putting all this together. Love the idea of the minkie on the back. It is looking gorgeous. Hi Karen – thank you 🙂 It was really fun to just pull out a few stacks of each of the colors to make the strata pieces. 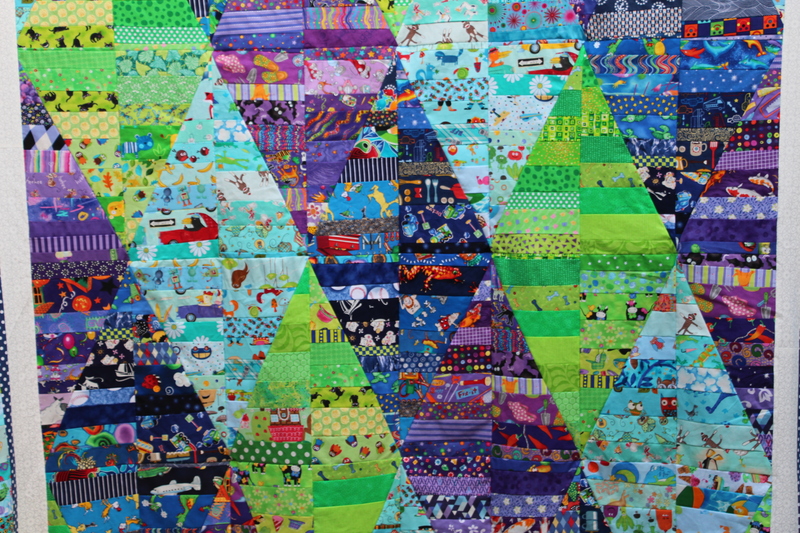 I like how you can see the individual fabrics in this quilt. Love, love, love your colors and what a fabulous design! Is it your own original pattern? Queen sized? Awesome – I hope your daughter loves it! 🙂 Congratulations on finishing the top! Can’t wait to see other diamonds – they’re such a fun shape to work with.